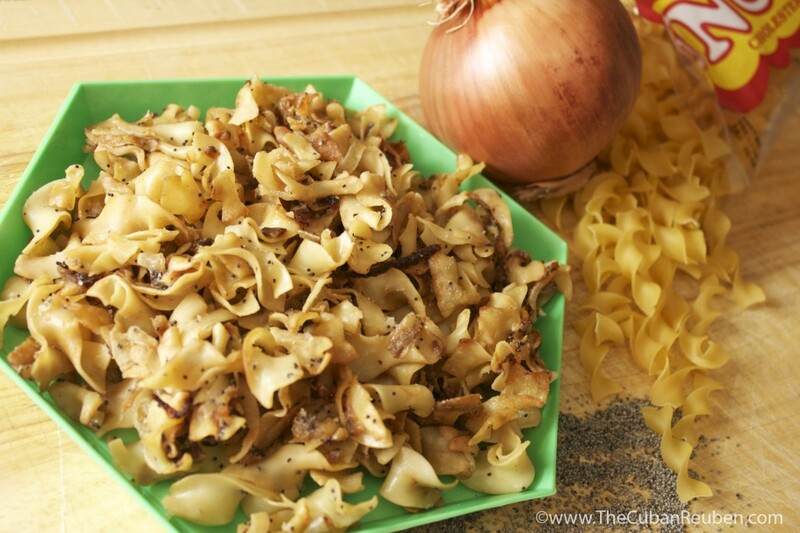 Onion Noodles: One of life’s simple pleasures. Lately, I’ve noticed that during times of great pressure and stress, my natural inclination is to arm myself with some of life’s simple pleasures. I take more naps, I spend more time outside partaking in a range of activities, and I unapologetically partake in comfort foods. To me, comfort foods are those dishes that bring an element of nostalgia, and remind me of more carefree times. Maybe it is my Abuela’s creamy arroz con leche, or a piece of fresh baked toast smeared with smashed avocado. For Kenny, it’s usually meat and potatoes (surprise, surprise), or a similarly basic starch. In both cases, the best comfort foods are almost always very simple, simple, simple. There’s no rule that says good food must be complex. Take onion noodles, for example. There are only 5 ingredients in my mother-in-law’s recipe, yet it is one of my husband’s all-time favorite dishes. In addition to the famous chocolate cake, it’s the only other dish he requests every year for his birthday celebration, without fail. What’s so good about onions and noodles? More like, what’s bad about onions and noodles? 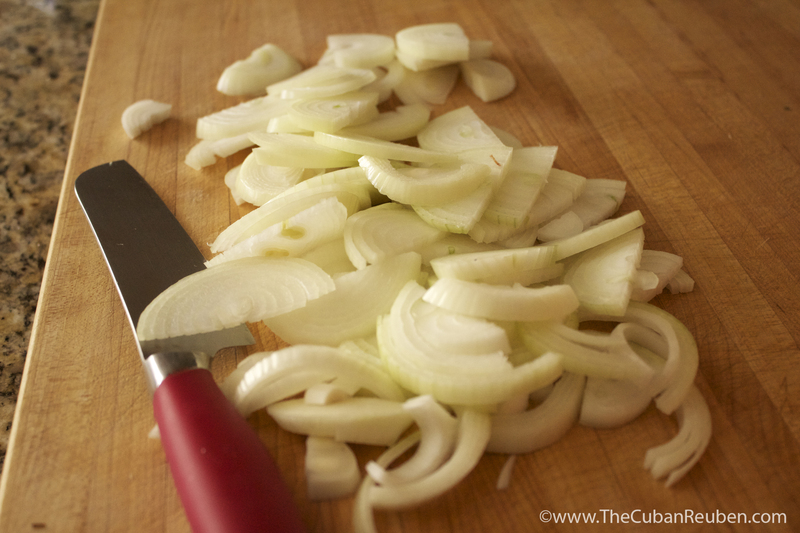 Lots of sliced onions, ready for the saute pan. Imagine if someone shook an onion bagel over your dish of buttered noodles, and crisped the edges like the best part of a kugel. Then you can sort of grasp the intended flavor and texture of this dish. But the brilliance is really in its simplicity. That being said, my husband never fails to inform me that my onion noodles don’t look the same as when his mom makes them. After a little trial and error, I think I’ve figured out why my version turns out more golden brown than Kenny is used to. To put it bluntly, making this dish the best that it can be requires a certain degree of patience. And well… patience has never been a virtue of mine. While I certainly take the time to really slowly caramelize the onions until they are a soft brown, by the time I add the noodles, the inviting aroma takes over, and my patience for letting the noodles sit and crisp wanes. There in lies the difference. Bette Jo let’s her noodles sit and crisp in the pan before she stirs them ever so gently, whereas I am less patient, stirring a bit more frequently, and the brown from the caramelized onions disperses throughout the noodles, tinting them a brownish hue. That, and like a good little Cuban-American, I add a little garlic to the recipe. Either way, the two versions more or less taste the same, but between you and me… those crunchy bits that Bette Jo achieves by being patient? They are without a doubt worth the wait. As an extra tip, I advise that you serve these alongside something saucy, so the noodles can serve as a vehicle for heightened flavor. And make extra. Trust me on this one. ** It’s just been brought to my attention that this recipe was introduced to Bette Jo by her sister, Myndel. Looks like we’re not the only one who think this is comfort food! Old-world comfort food, whose crispy edges will have your guests begging for more. In a large frying pan, heat the butter (or margarine) over medium heat. Add the onions, and saute until light brown. Add the garlic, poppy seeds and season salt. Stir to combine. Once the onions are golden brown, add the noodles, stir to combine, and let sit until the bottom side of the noodles crisp. Stir, and let the other side get some color. 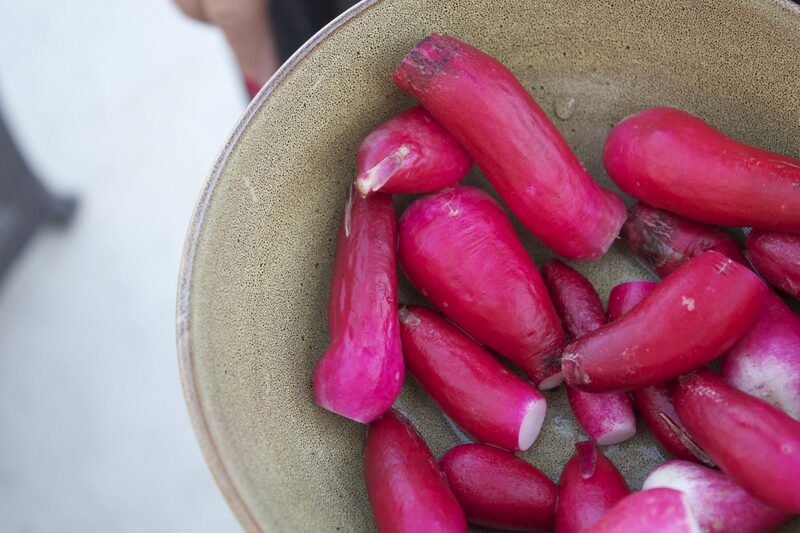 Once desired color and crispness is reached, serve immediately. The garlic is definitely optional, but I think it adds an extra layer of flavor. This a great side dish to accompany the famous braised brisket eaten in Jewesh holidays.